I’m currently pondering whether to make a third or not. I’m happy to continue in this vein, and I do think a group of three similar things is more satisfying and altogether better than a group of two… but perhaps I should be heading off in another direction. I’ve got lots of ideas, but insufficient time…. we’ll see. I expect quite a lot of you already know about Jude Hill and follow her Spirit Cloth blog. In case you don’t, you might be interested to know that she has started a project called ‘Feel Free’ which provides all of her teaching material free on her website (previously she used to make a modest charge for her teaching materials). I spent some time last week exploring her Spirit Cloth 101 class, and I think it’s excellent. The text and photos are interspersed with video and audio files and I love to hear Jude’s calm voice describing what she’s doing. I’ve so enjoyed watching and listening to the material. Each time I go back to the site I find there’s more available on it. You may, or may not, like the Spirit Cloth style and ethos – personally I find them very appealing. Access to the ‘Feel Free’ project is genuinely free, but if people want to make a donation in cash they can do so. I’m going to do this, to show my appreciation of what she’s doing, because I have the means to do so. But if you don’t have the means, there’s no pressure or obligation to contribute. You can also register your email address on the Spirit Cloth blog, so that you get updates. I’ve been doing this for a while and it’s worth doing because the updates are daily (I’m in awe of this, as I find it really difficult to post even twice a week). They tend to ping into my inbox during the afternoon in the UK, and I look forward to them when I’m spending long hours at the computer working. When I was experiencing some glum, dark days a while ago, I found that these daily updates really brightened my day. One day I emailed Jude to tell her how much I appreciated them, and got a reply back straight away. Although my blog audience must be tiny compared to Jude’s – she’s been doing this a long time – I really appreciate it when I hear from readers. I had a lovely message the other day from a reader to tell me that she really liked my embroidered edges which are featured in the gallery. It made my day, and made me feel that the effort I put into the website and blog is actually worth it. So thank you to those readers who drop me a line or leave a comment. It’s much appreciated. I’ve been looking forward to seeing this one, and I’m pleased to report that it’s been worth the wait. The book is in the usual 128 page hardcover Batsford format. 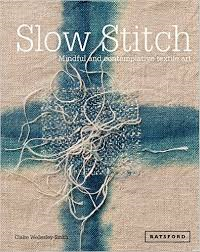 Its full title is ‘Slow Stitch: mindful and contemplative textile art’. The quality of the images is uniformly excellent and the text is well-written and thoughtful. It’s divided into four sections: Slow, Materials and Techniques, Cross-cultural activity and Contemplative. It’s redolent of a particular philosophy and approach to the process of stitching and it’s worth reading carefully and, well, slowly. 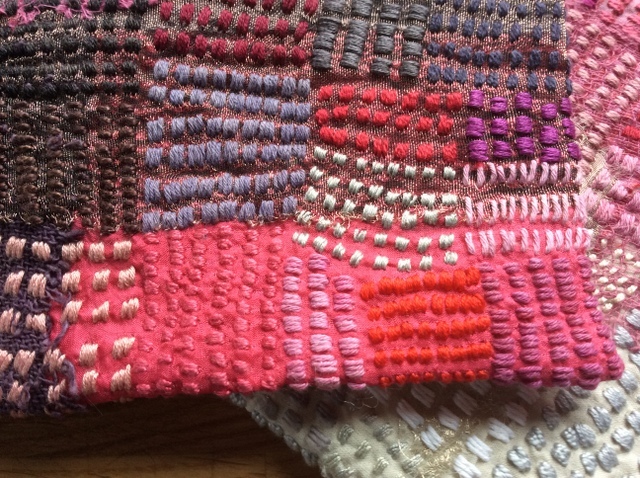 The first section (‘Slow’) relates slow stitch to the Slow movement in general, and discusses the related issues of sustainability and use of resources. ‘Materials and techniques’ identifies sources of old and new materials. 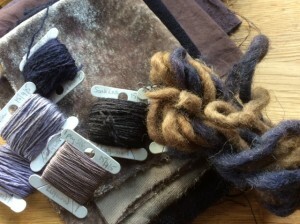 It also has a relatively brief section on dyeing using native plants. I expected there to be much more about natural dyeing in the book, but actually there are plenty of other sources of information about this and there’s no particular need to explain it in any greater detail here. 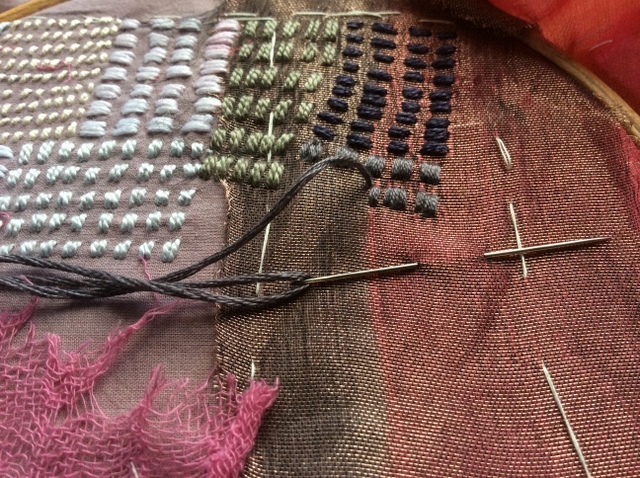 ‘Cross-cultural activity’ looks at some relevant stitching traditions, including Kantha and Japanese boro. It also contains a good section on mending (both practice and philosophy) and on piecing and patching. Finally, ‘Contemplative’ is perhaps the most important section of the book in that it expounds the benefits of mindful practice, together with some practical suggestions for developing ideas. 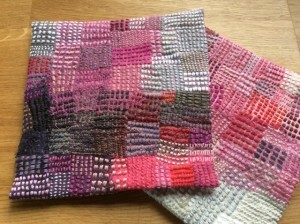 I especially like the idea of the stitch journal as a means of daily practice in stitching. I, too, feel that there’s something about stitching that helps in problem-solving, and with the flow of ideas. 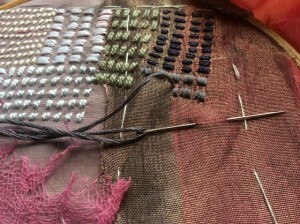 The process of stitching contributes to creativity and the flow of ideas. It’s always interesting with these books to see the range of work that the author draws upon for illustration of ideas. Claire has included examples of the work of some of my favourite artists, for example, Judy Martin (if you don’t know about the Mantoulin Circle project, do follow the link and have a look), Roanna Wells, Mandy Pattullo and Christine Mauersberger, to name but a few. 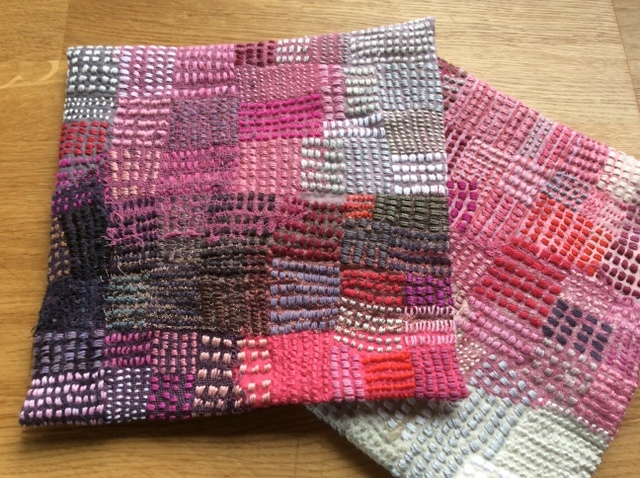 And above all, there are lots of examples of Claire’s own understated and calming stitched works. All are beautifully photographed. If you’re familiar with Claire’s website you will know how good at photography she is, and I expect these are her own photographs of her own work. This is not a ‘how to’ book, although it does contain some guidance about using plants for dyeing and suggestions for e.g. 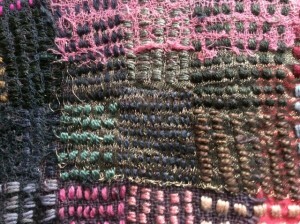 stitching a square and producing kantha stitches. 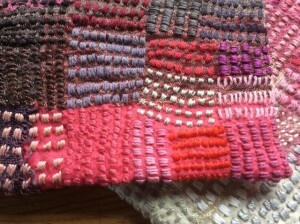 As much as anything, it’s a book about ideas and a particular approach to stitched textiles that I, for one, find very appealing. A couple of weeks ago I got an email from Brenda Gael Smith, who has curated Living Colour Textiles, to say that the final exhibition would be taking place in Des Moines from 10 September to 3 October. So by now, it’s all done and dusted. It’s been lovely to get a series of emails from Brenda keeping me and others up to date on the stately progress of the exhibition around New Zealand, Australia and the USA. It must have entailed a vast amount of work for her, and I’m so pleased to have been part of it. Soon she will be sending my well-travelled piece back to me. Brenda is organising another travelling exhibition ‘A matter of time’. 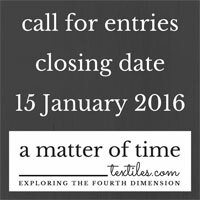 The closing date for entries is 15 January 2016. I have an idea for a piece, and indeed had the idea quite a while ago, but have not yet got round to doing anything about it. If I can exert myself to put in an entry I will do so. The volume of entries is likely to be high, so it’s quite a competitive enterprise with a relatively small probability of success. But you never know…. Click on the image to go to the Matter of Time website where you can find all the details for entry. And why not have a go? There’s still time. I said a few posts ago that I was going to continue with the same theme as previously, to develop and work on another cochineal-based piece. Working title: Cochineal Dream 2. Just to show that I’m getting on with things, and not spending my time just crocheting woolly animals, here’s a photo of Cochineal Dream 2 in its early stages. I suppose the first thing to say about this is that it’s got less cochineal in it than the first piece. As you see, I’ve not used any cochineal threads yet. However, you can gather something about my intention from the Barbie pink piece of cotton scrim in the bottom left hand corner. There will be more pink and red in this – just not yet. I intend to make this darker in theme, with more distinct areas of darkness and light. As ever, I’m enjoying the process of putting this together and working on it very much. I’ll report back on progress. Part of my plan is that it should be very similar in shape and dimension to the first piece which was more or less square. I think I’ve mentioned previously on this blog that I’m endlessly fascinated with the square. The exploration of the Klee-style blocks embodies squares, and it seems appropriate to create whole pieces in my favourite shape. I’d like to do more on grids and squares, and maybe I will. Keep watching…. As you see, I’ve got a wonderful range of grungy shades out of this exercise, and I’m looking forward to trying some more combinations. I also dyed a few threads and pieces of wool. I find that I use up the threads very quickly and never seem to have enough. I should probably dye just threads for a few batches to lay in a supply. 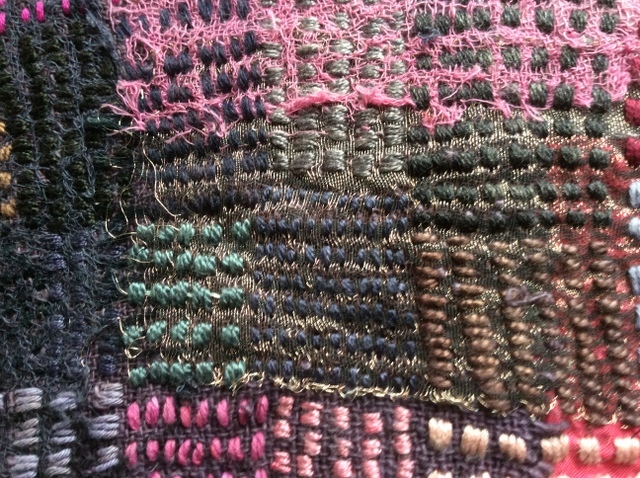 The second photo shows some of the threads. 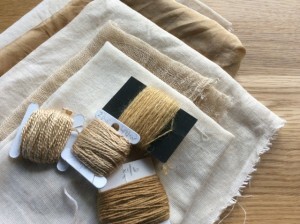 The yellowish-brownish piece of wool on the right hand side was mordanted with rhubarb leaves, but otherwise these are not overdyed threads. The scope for this type of experimentation is infinite. 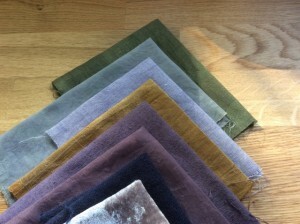 You could overdye several times, and try out all sorts of colour combinations. The more I do this, the more I realise there is to know about dyeing. Watch this space for future experiments in colour…. Some excellent news yesterday: I’ve been accepted as a member of the Prism textiles group. Woo hoo, as my daughter would say. I’m very pleased indeed. My friend Laura tells me that if I’m trying to avoid using Amazon I can’t shop at Book Depository because it’s owned by Amazon. And so it is. The tentacles of Amazon are many, and very long and snaky, it seems. Laura tells me she’s been ordering from hive.co.uk Looks very good, and there’s an ebook section, which you can use if you download the Hive app. Well, good, I’ll do that. I ordered 3 books from Book Depository and actually, the service just wasn’t that good. One of them was Claire Wellesley-Smith’s new book, Slow Stitch, which at the time was due out any day but had not yet been published. So in that case there was a valid reason for delay. But I’m not sure why there was a delay on the others. So next time I’ll try Hive. I’m busy reading and absorbing the Slow Stitch book, and I’ll put a review on here in due course. In the meantime you could read the review of the book on Judy Martin’s website. One of the other books I ordered and recently received was ‘Edward’s Menagerie’ by Kerry Lord. This contains the instructions for crocheting 40 animals. I have taken time out from stitching to pick up a crochet hook after many, many years, and I’m rather enjoying it. One of the nice things is just following a pattern – it requires no creative input whatsoever and is really rather relaxing. So far I have made a charming sheep and I’m currently on with an elephant. Such fun. The vegetable-based materials are always less likely to take up natural dye colour well, and this is no exception to that general rule. The silk takes up the colour best, but the wool is also good. I’ve wound the two-ply lambswool onto the black card in the centre; this has been very successful. Right at the bottom is the sock lace (a mixture of merino and silk) which is a beautiful yarn and which has dyed beautifully. I like these muted browns very much. I’m struck by the thought that perhaps I’m, at last, coming round to brown. The school I went to between ages 11 and 18 had a brown school uniform. Everything was brown: blazer, skirt, socks, hockey socks, even knickers. Even if you’d started your school career liking brown, it was pretty unlikely that you’d still like it by the time you got to stop wearing it. I’ve never been able to countenance wearing it since. Even brown shoes. So much for early conditioning. Perhaps I’d have got deeper colours if I’d boiled the shells for longer. Or left the materials in the dye for longer. I just don’t know. Does anyone reading this have any experience of using walnut shells for dyeing? Please let me know if you have. Christmas will soon be on us again, with another opportunity to save some shells.